Nature photography is not only for photographers on-equipped and remains accessible to anyone with a camera and sense of observation. The objective of this course is to improve your knowledge in nature photography. Learn how to use the right settings on your camera according to your subjects. Pieces of information about habitats and species will be given to improve your knowledge and understanding of nature to better achieve the photograph. A particular attention will be paid to the ”extraordinary common” or how ”ordinary” species can be a great subject for photography. David Tatin is a photographer and naturalist. He worked for 17 years in the Nature protection, including at the Vigueirat Marshes and collaborated for 10 years with the agency Biosphoto, which makes him an experienced nature photographer. He regularly works with various regional parks for taking photographs or giving introductions to nature photography, and he is the author of the guide ”Nature walks in the Luberon” (Dakota editions). His most personal series cover the landscape and the environment. His photographs are regularly exposed (Off des Rencontres d’Arles, Montier-en-Der,…) and published (Nat’images, Réponse Photo, Chasseur d’images, …). The course is confirmed when 4 people are included (a deposit of 40 euros will be asked). 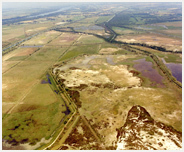 Part of this amount is applied directly to the conservation actions of the site. The objective of these courses, open to all, whatever your photographic equipment, is to improve your knowledge in nature photography. Learn how to use the right settings on your camera according to your subjects (macro, wildlife, landscape). The duration of a week-end allows to combine theory and practice, and to alternate sequences inside and on the field, on a rich natural site and on which we will spend the night. The background and experience of the supervisor enable him to respond to technical questions as well as guide you to more personal images. 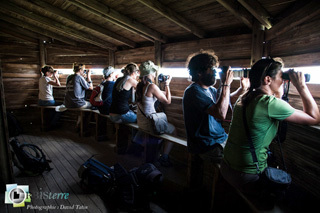 David Tatin is a photographer and naturalist (www.orbisterre.fr and www.davidtatin.com). He worked for 17 years in the Nature protection,(Vigueirat Marshes, CEN PACA) and collaborated for 10 years with the agency Biosphoto, which makes him an experienced nature photographer. The course is confirmed when 4 people are included (a deposit of 80 euros will be asked). What is the photography in a floating hide ? The extension of the wildlife photography as well as the growing demand for this discipline involves an upstream information on threats faced by wildlife. Educate wildlife photographers to protect species and about their role of information to other photographers is an educational and legislative response that wishes the GLAAE association, through this course. Become familiar with the technique of using a floating hide and to capture images. Learn how to use your camera equipment under real condition. This is 100% pure nature photography ! Improve your knowledge and understanding of nature. Be more aware of the fragility of the natural environment and the wildlife that inhabit it. Educate people around you on the need to protect them. Gérard Schmitt is a naturalist and wildlife photographer born in France in 1950 who grew up in Brittany near the forest of Broceliande.